After having served on JFA’s staff from 2006-2018, Bubba Garrett continues to regularly volunteer at JFA outreach events. You can support Bubba’s volunteer efforts using this pledge form or by supporting JFA’s Training Program Fund. 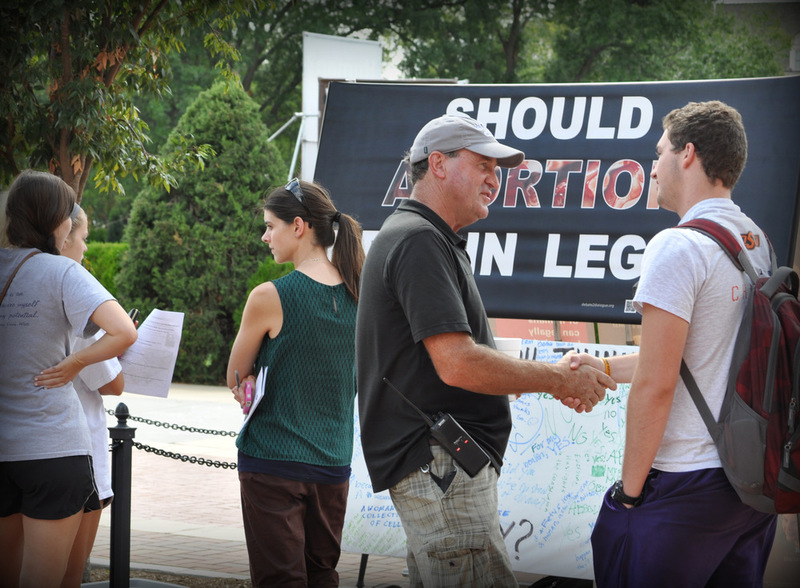 Bubba has been regularly engaging college students in conversations about abortion since shortly after he began serving in full-time pro-life work in 2001. Since then he has logged thousands of hours of outreach on over 50 university campuses. Bubba is eager to reach out to students who need Christ and the truth about human value. He also brings a servant’s heart and a hearty work ethic to thankless tasks, such as hauling sand bags and carrying aluminum pipe, and along with JFA, he serves as a volunteer for a number of other pro-life organizations. In all of this, he serves the Lord Jesus Christ as if his life depended on it. He was a captain in the United States Marine Corps, serving from 1974-1980, a manager in the corporate world, and was the Executive Director of a Christian mission in downtown Birmingham, Alabama. He holds B.A. degrees in Biology and History from Huntingdon College as well as a B.S. in Health, Recreation, and Sports from the University of West Florida. Bubba is a father of three biological children and during three years of service at a children's home, he and his wife cared for six additional children with whom they still keep in touch. He especially enjoys being a granddad and reminding people of how wonderful his wife is for being so patient with him throughout "43 glorious years" of marriage. In his free time, you might find Bubba reading and biking all over his home state of Alabama, but not at the same time.